Okieladybug's Scrap N' More: It only took 2 days! But I did get a card made. Actually I can say it took more than 2 days since I started this card last week with the base and the scraps. 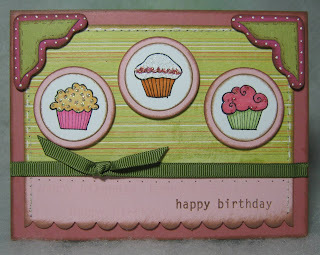 I decided yesterday to use the Studio G cupcake stamps on the card. I usually make more than one of a card. Not this time *okie thinks her mojo has gone out the window*. Oh great a commerical for NicoDerm CQ just came on. I never noticed how many "stop smoking" commercials were on tv until now! I think it is like being pregnant....ya know you notice that EVERYONE is pregnant when you are, but only because you are paying more attention. Oh back to the card. So yeah I only have one of these so ya know I will never use this one. Besides I think it is ugly *okie laughs at herself*. I used Jasmine for the photo corners, and they were actually some left over from another project. The ribbon and pink papers are Stampin Up that were left from the workshop I went to last weekend. The printed paper is just some scrap I had. I did stamp the happy birthday with a versamark ink on the light pink but don't think you can see it in the picture. And just in case you are wondering.........YES I WANT A *google censors okie's next few words* CIGARETTE TO CELEBRATE GETTING THE CARD DONE!! oo Okie you do have a great sence of humor, I love visiting your blog. OOO I do like the card you made. Well first card is done, more wil follow. Can't wait to see more of your projects. Keep up to good work. hang in there - you are doing good. I like the card and was wondering how you made the cupcakes cute colors - I bought these stamps but am having a hard stamping with them (I am new to stamping) but the ink seems to bubble on the stamp. Is there a certain type of ink to use or do you color them in after you stamp them in black? Any help or advice you can pass along would be much appreciated!! I Love this card and will probably scraplift it! Thanks for sharing!